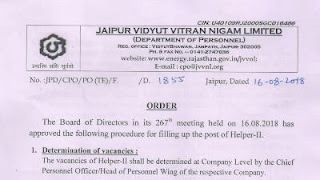 JVVNL Recruitment for 2089 Posts - NewJobVacancy.in - New Govt Job Vacancy 2019, Admit Card, Study Material Pdf & Results. Other State's Candidates will be Treated as General Category. Total Number of Post: 2089 Posts. Maximum Age- 28वर्ष (General के लिए) और ST/SC/BC/MBC/ के लिए 5वर्ष Extra. Click Here To Apply Online for JVVNL Recruitment. Click Here To Download JVVNL Recruitment Official Notification.